Agreed Conclusions Have Been Reached at CSW58! 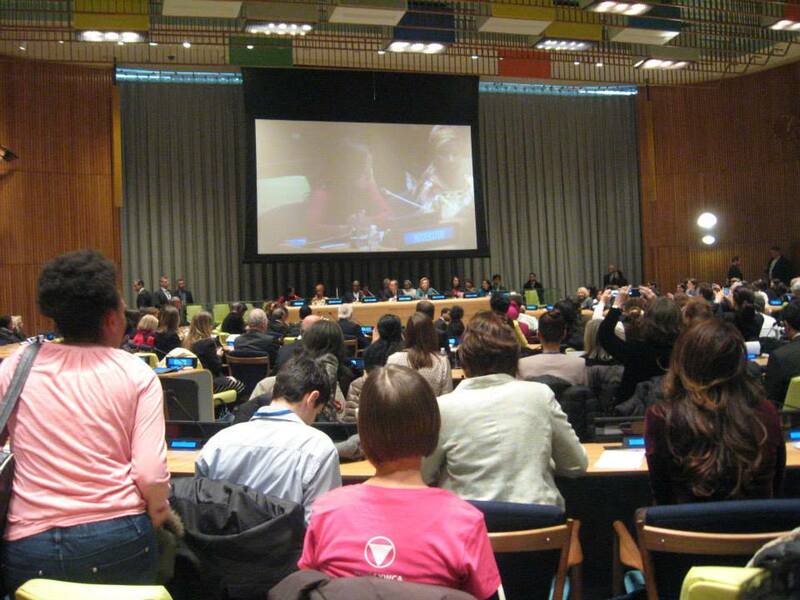 Agreed conclusions on the CSW58 priority theme of “Challenges and achievements in the implementation of the Millennium Development Goals for women and girls” were reached late in the evening this past Friday, 21 March. To read a statement from UN Women on the news, click here. To read an advance unedited version of the agreed conclusions, click here. Tina Van Ochten, one of the Presbyterian delegates to this year’s CSW shares part of her experience studying math in University and how it relates to this year’s Commission. Kayleen Sam is an intern with the Salvation Army. Here is the story of her experience at CSW58 and how it relates to life where she is from in Papua New Guinea. This morning, March 20th, the Salvation Army led worship for Ecumenical Women and Josephine, an intern with the Salvation Army and a member of our communications team, offered this dance as a part of the service. What follows is a piece written by Kristen, a young adult delegate from EW member organization the Evangelical Lutheran Church in America to CSW58. For more reflections of the ELCA young adult delegation, check out their blog. The following are just four of countless stories of incredible women that come to mind when I consider the priority theme for this year’s Commission on the Status of Women, “Challenges and Achievements in the Implementation of the Millennium Development Goals for Women and Girls.” I have first included a quick listing of the Millennium Development Goals, followed by four stories that stand independently and do not necessarily flow from one to the next. The stories are united in the concrete expressions and faces that bring the successes and failures of the Millennium Development Goals to life. I encourage you, the reader, to reflect on the women in your life who have also embodied the struggle for a more just world. The face of human trafficking for me sat across the table at a center for people with addictions adjoining a homeless shelter in eastern Hungary. As a volunteer at the shelter I tried to make conversation as best I could with my limited knowledge of the Hungarian language. Our conversations often involved travel since I was the odd foreigner they couldn’t quite figure out and one morning this woman, who I will call Maria, mentioned that she had previously lived in Amsterdam. Both naively and excitedly I latched on to this thread of conversation and asked her a dozen more questions, thinking that we might have something in common in having traveled abroad for work. She revealed few details other than the work that she had done was “very bad work.” Later I learned that there is a street in the red light district of Amsterdam named after the city in eastern Hungary that I too called home because so many women and girls were taken from that city. The tragic social and ethnic backdrop to this story is that most of the exploited women and girls are Roma. As members of an ethnic minority, most Roma women and girls face bleak prospects due to low primary school completion rates, employment discrimination, and high rates of pregnancy among teenagers. Driving west along a rural highway in central Hungary, I also saw several women standing alone on the edge of the road. I will never know where they were and are going, but I can only hope that they too were not setting out on a journey like Maria’s. I do not know how she was able to return home to eastern Hungary nor do I know for sure if she is still safe today, but I do know that universal primary education, health education for women, and equal access to employment in Maria’s neighborhood and many other just like it are essential to ensuring that more of her friends and neighbors do not suffer as she did. “Developed countries” as much as any other must to do more to protect and empower ethnic minorities who are all too often forgotten. Universal primary education is a goal that is still unmet in the rural villages of Mexico, El Salvador, and Honduras. I know this not from ever being there, but from helping first-generation immigrants to the U.S. Midwest complete job applications available only in English. Most of the clients requesting this service are men and rarely do they list more than a few years of schooling in the education portion of the application. Witnessing the social structures of this particular immigrant community, where girls as young as middle school are expected to care for their younger siblings while their parents are away at work, would lead me to guess that girls in these remote villages receive the same if not less education. I also see this reality as we work to tailor adult English language courses to the needs of the women who attend every session but cannot read or write in their native Spanish. The evidence of the empowering effects of education is clear. Improving school retention rates in rural areas must be a priority for the post-2015 Sustainable Development Goals. Education rates among ethnic minorities such as the Roma in Europe, who are often subject to multiple discrimination, must also be closely monitored. In rural eastern Hungary most villages are largely homogenous, with either Roma or non-Roma residents but rarely both. The living conditions in the Roma villages are almost always worse and shockingly few children complete primary school. Without equal access and attainment at this early age, Roma young people will never catch up with their non-Roma peers and ethnic tensions over jobs, demographics, and social services will only worsen. I had the privilege of working with 20 Roma students through a program that supported their university education. Sadly they are the exception, not the norm, but their stories demonstrate that small steps, one student at a time, can make an enormous difference that could one day transform the country in which they too are citizens. When I asked one student how she had come to the university to study, she explained that like many of her peers living in a small village she had little intention of continuing her studies. However, a kind neighbor invited her to attend a visit day at a high school in a neighboring city that prepares students for university. That day she was welcomed so warmly she decided to attend. Four years later seeing her friends apply to local universities she couldn’t help but do the same. Concrete actions such as this simple invitation on the local, national, and international levels are essential to reaching many more students like her, especially those living with the labels of ethnic minorities and growing up in tiny rural villages, so that they too can study beyond the primary level. One of the women I most look up to lives in eastern Hungary. While the economy values her work as a pastor at a humble salary in forints, it does not recognize her contribution to society as a single mom and primary caretaker for her aging mother who still lives in her rural home with a large garden. “Developed countries” as much as any other must rethink the way that we honor and value caregivers. 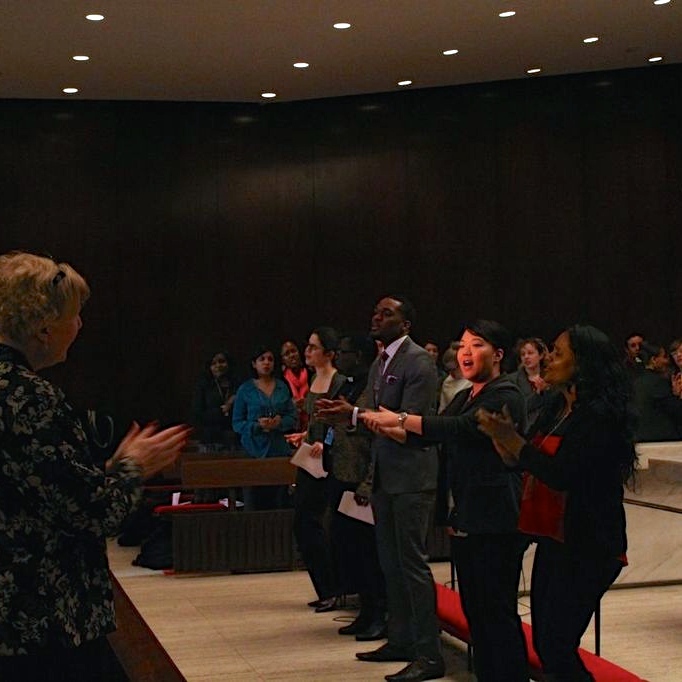 Delegates from the Anglican Communion and various provinces of the Anglican Church around the world are a significant part of Ecumenical Women’s presence at CSW each year. Many of them have been sharing their experiences through their own international, national and local forums. Click the group photo to read about the experience of Ellen Duffield, a first time delegate from the Diocese of Algoma in the Anglican Church of Canada. Members of the World Federation of Methodist and Uniting Church Women led worship this morning on the 6th Millennium Development Goal – Combat HIV/AIDS, malaria and other diseases. As part of their worship they presented a dramatic reading of the story of Jesus and the woman with the flow of blood from the Gospel of Mark. Check out this interview with Hannah, an Ecumenical Women youth delegate from the Episcopal Church who returned home after CSW57 and was inspired to start a radio show in her home town that deals with a wide range of issues that contemporary teenagers face. This year at CSW58 Hannah held a parallel event discussing the work of her radio show. An interview with Maria Cristina Rendon, Program Assistant in the Lutheran World Federation’s Department for Theology and Public Witness and Reverend Elitha Moyo, Coordinator of the Gender Justice Project of the Evangelical Lutheran Church in Zimbabwe. Elita and Cristina, both who are also Ecumenical Women delegates to the 58th UN Commission on the Status of Women, discuss how CSW relates to their gender justice work on both the international and grassroots levels.